Hello All, I enquired here awhile ago about the differeence between the old style flat seats and the new one like my '03 came with. Momma hated the newer style seat as she was always sliding forward and I felt a jammed into the tank. . I was able to strike a deal with a member here for a nearly new old-type seat and yesterday Momma and I took Her out for about 1-1/2 hours. Momma is much Happier now as am I. the foam is much firmer and no sliding into Me. Happy in Ohio. I have never figured out the mentality behind the seats where the passenger rides higher than the driver. This puts the passeger's head in the turbulance and also raises the center of gravity of the bike. I think they are also uncomfortable. hey jim in ohio this is jeff in ohio. my wife is very unhappy riding on the back of my 06. I spent 2 hundred bucks on a stock kawi backrest and the bracket it bolts to. if she uses the backrest there is too much space between us and she slides forward. my old bike had a 18" backrest and two piece mustang seat and we were packed in there tight. I was looking at the corbin canyon seat with passenger backrest but was hoping someone here has used that seat and how well did it work or other seat suggestions. I like the step seat for myself and think a flat seat might still be a little long to make the wife happy. thanks. I have the same setup and problem with passenger not able to reach the backrest and sliding into me. I have about 1/2" space behind me to the step also that doesn't help. I've been thinking of adding a bracket to bring the backrest forward and maybe reworking step by adding foam to the move the step more forward, not sure if the cover will just squish the foam or if there is enough material to move the cover forward a 1/2 inch. Flat seat might fix this problem. I'll let you know what I end up with for a bracket on the backrest. thanks. moving it forward would help but she also complained that backrest pad wasn't high enough. I thought about a trunk with a built in pad but I think that would still be too far back. let me know if you design something that works. Find a good seat builder in your area and have him raise the front part of the rear seat till it is flat. This will keep her from sliding into you. the stock 06 seat is fine but does have it issues for the passenger. My seat is the stock seat reworked and covered. No more issues. It's called the catapult seat for a reason. My SO doesn't ride anymore because the bike's too difficult for her to mount and it's not all that comfortable. 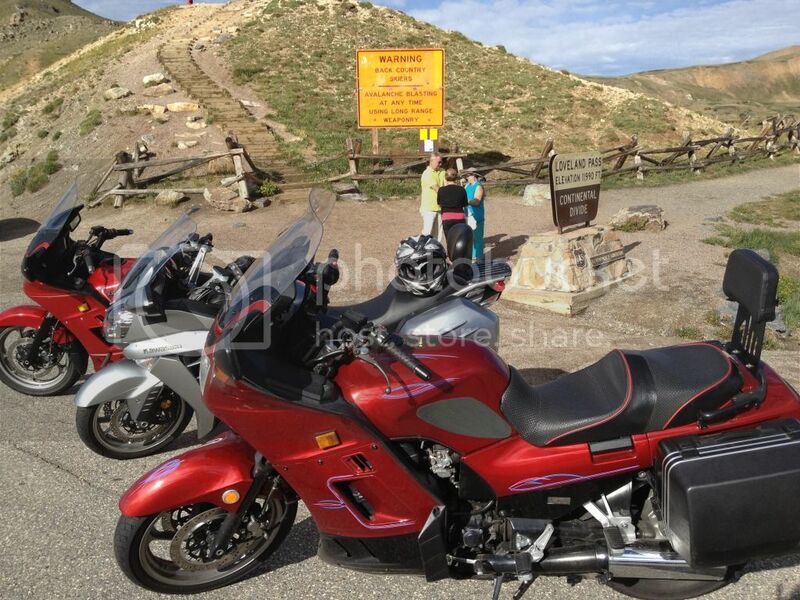 She even tried pillion on a Goldwing without success. The reason, believe, for the way the current day seats are positioned has to do frame design and things like that. I don't believe it's just because young boys like to have young girls laying all over them while they're riding. That said, I'd really take advantage of it if I was young(er). That and the bikes are really designed for much smaller people than we older Americans have turned out to be. 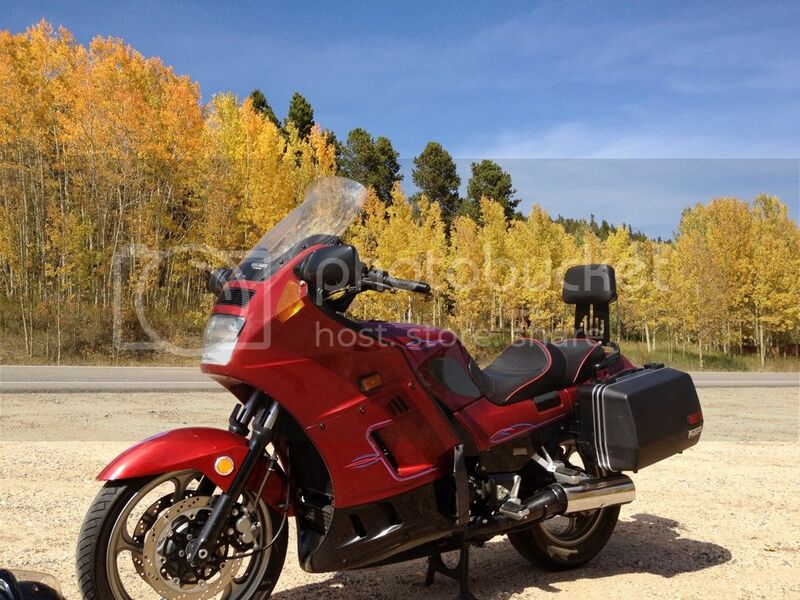 There are flat seated bikes available, just not of the sport touring or touring variety. as always f-106 your seat makes me drool. if I can find the money I might just send it to the guy that did yours. and buy a topcase like yours and paint my bags like yours. I will leave my kawi badges on my tank so they won't look exactly alike. still would like to hear if anybody has the corbin canyon and if it is worth the money. It's expensive, but a Russell solves all the problems. That's a custom Corbin based on the OEM shape. Whoever had it made didn't have many changes made to the stocker. KCR is the initials of the guy who crafted the saddle. Looking again, that looks like a a reshape of the G&F to make it longer, and a bit wider. But whoever rode it, sat lopsided. Must have been a Harley rider. crocker- does your corbin help you sit back a little instead of the forward lean of the stock seat. that is what the canyon dual sport in my earlier link is supposed to do. and the option for the passenger backrest looks like a lot better support for the wife than a stock kawi backrest. do the FARKLES ever end.
. do the FARKLES ever end. Here is my Corbin seat that I bought through the emporium from a fellow COG-er. This seat has a textured pattern where you sit and helps with the sliding. I had another corbin on that was smooth and almost flat and my wife and I were always sliding forward. Now we only slide during really hard braking but a lot of that may still be the front diving. I am planning on modifying the fork springs to help with that. Also this seat sits a little lower so i am pretty well flat footed. My wife didn't like the backrest, said it was to low so I made a piece of flat steel and raised the pad about 12" and now she loves it. I have 2 Corbins. An old one that I love. Leather covered, with a larger passenger/smaller Rider area's. Unfortunately (after life on 3 Connies), It has developed a small tear at the front edge. So I bought a almost new one from a fellow COGger. It is too hard for me, and has a different seating position than my old. Great in the twisties, but for a long time in the saddle,,, rough on the hiney. I may send a stock seat or the Old Corbin to them and see what they say. F-106's seat looks great!! Anybody know of a seat guy near Houston? Ted, call Rocky the man that did my seat.Send your seat or seats to him. You will not be dissapointed cheaper than Corbin by far. On my 04 saber I had it came with a Corbin and I did not like the cover. Rock was jammed with work that year and could not get to it for 4 months. I took it to corbin and they wanted 450-500 fo a recover. Ended up sitting it out and Rock got to it and it was only 275. Rocky is a former C-10 owner. Here is a link to his site. Unfortunately, It has developed a small tear at the front edge. wile_e _coyote. very nice mod on the backrest. I like the texture on the seat too. good idea. that looks like what I want some day. Note sent to Rocky. Thanks! PS: If/when I repair my Old Corbin, I'll sell the newer Corbin to anyone that is interested. Page created in 0.652 seconds with 25 queries.